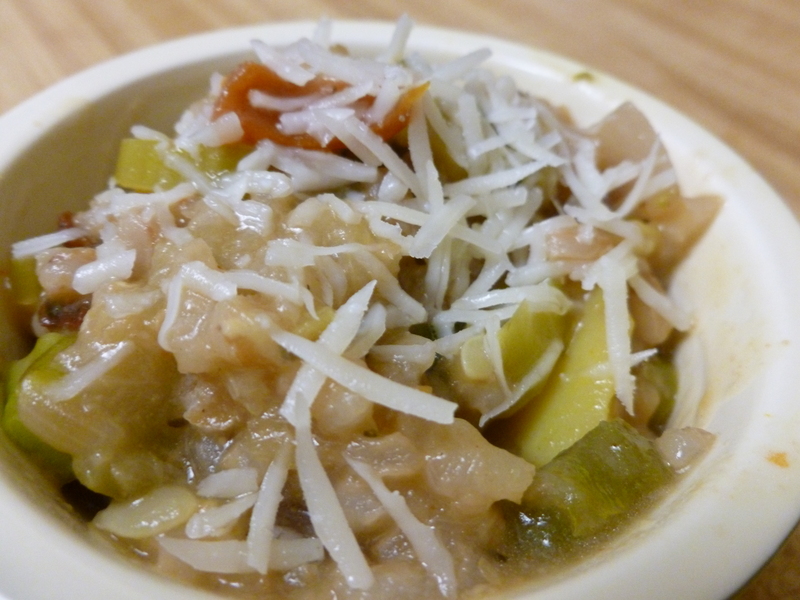 Risotto is one of my favorite dishes because it is infused with cheesy goodness. If you’ve never tried your hand at making it, or if you’re afraid of Gordon Ramsey materializing in your kitchen insulting your cooking skills in a British accent, forget Señor Ramsey and get cookin’ because this is just too good to pass up! (This video is definitely NSFW- language). But excellent for impromptu kitchen dance parties. That is all. Heat the stock on medium high in a sauce pan– if it starts to boil, turn down the heat but keep the cover on to keep the stock hot. 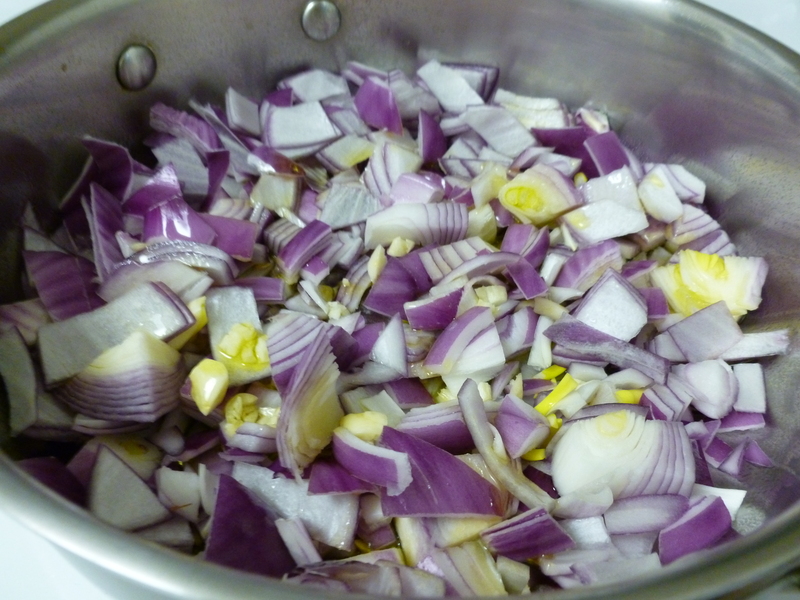 Crush and dice the garlic, and chop up your onion. Heat the EVOO in a sauté pan on medium heat. Once the oil is hot, add the garlic and onion, and stir with a wooden spoon (since you’re going to stir a lot, you want to use a stirring device that doesn’t conduct heat well). Sauté the onions and garlic for 3-5 minutes, until translucent. 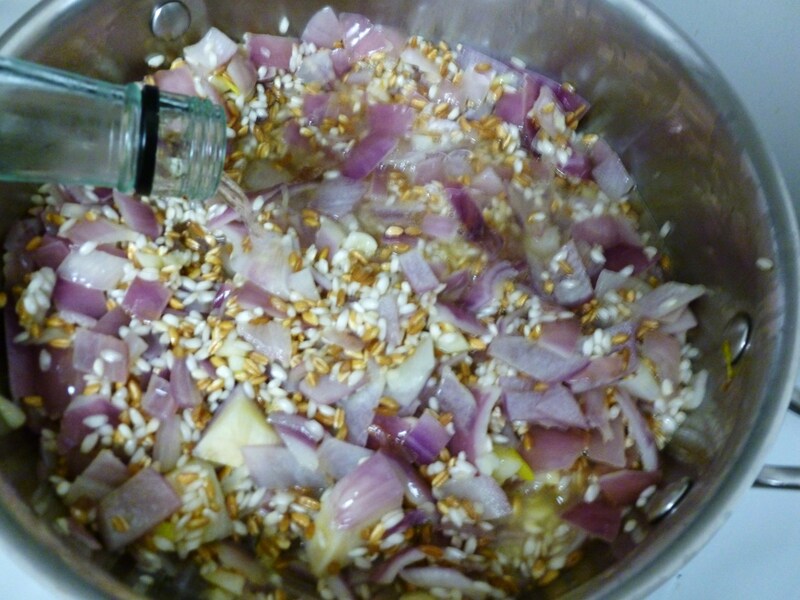 Add the rice and stir to mix into the garlic and onions. I ran out of Arborio rice, so I substituted with some farro that I had on hand. Note: Farro takes a bit longer to cook than Arborio. I’ve found that when using farro in risotto, it will be a little more liquidy the first day I make it, but after sitting overnight or for several days it tends to soak up a bit more liquid to make a thicker, creamier risotto (Also, I ❤ leftovers!). Let the rice cook for 3-5 minutes, until the kernels turn a toasted golden brown color. Next, deglaze the pan with the wine or an equivalent amount of stock. 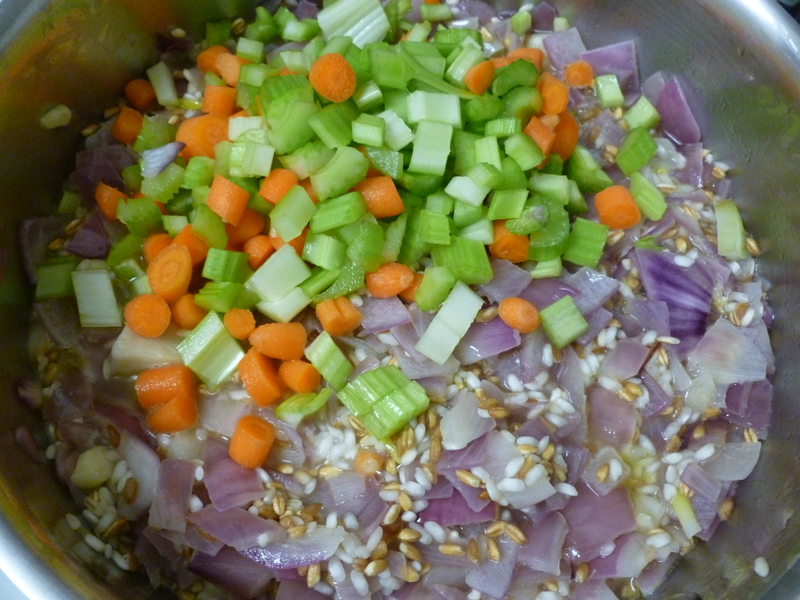 Add a ladelfull of stock and mix the rice and veggies into the liquid. 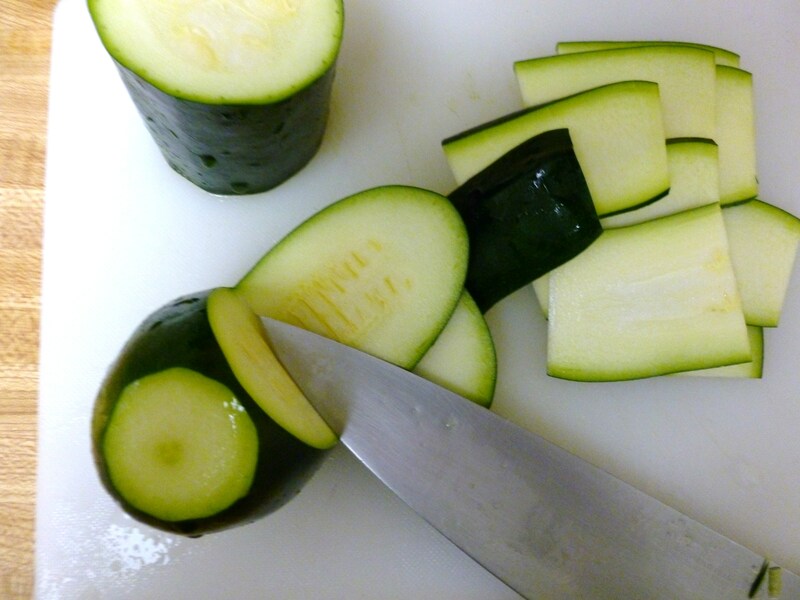 Chop up your veggies if you haven’t already done so. You’ll want to add the veggies to the rice mixture in order of how long they’ll take to fully cook, so carrots and broccoli stalks go first. Why do I use broccoli stalks, you ask? Well, to be honest, I just can’t bring myself to throw them away! It seems like such a waste to buy broccoli for the crown and then throw away perfectly edible food! I’ve found that these stalks work great as vegetable “filler” in meals where I just don’t have enough other veggies on hand, or in meals where the flavors and ingredients are strong enough to season this relatively innocuous veggie. I’ve found that it kind of has a mellower broccoli flavor than the florets, but melds easily into other cooked dishes– sauces, casseroles, rice. (After some quick googling, it looks like other people eat the stalks, too! Raw and cooked– check it out). I like the term “Stalker”- haha! Looks like raw stalks are loaded with Vitamin A, too! Add the veggies to the pan. Sprinkle around 1 tsp of each of your spices on top of the veggies, add a ladle of stock and stir. Slice the sun-dried tomatoes into strips and fold into the risotto. You can add them to the rice earlier or later depending on how infused you want the dish to be with their tomato flavor. Bread & Butter ProTip: If you’re using sun-dried tomatoes packed in oil, drain the oil into the sauté pan instead of using plain EVOO. This will add another layer of flavor to your dish. Or, use the oil to flavor a roasted vegetable size dish. 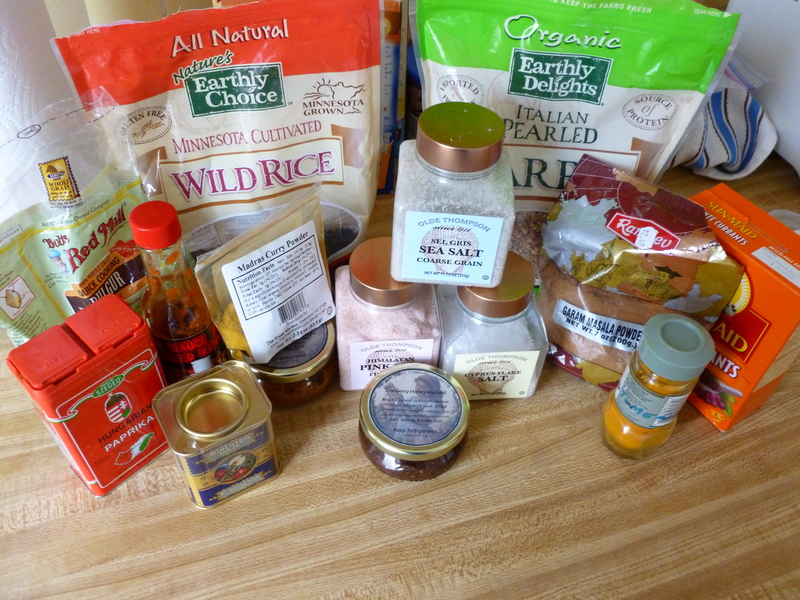 Alternate adding a ladle of stock, a pinch of the spices and stirring until you have used up all of your stock. You’ll want to wait until the liquid is mostly absorbed before adding the next ladle (if I’m pressed for time or feeling lazy, I’ll turn up the heat on the stove to move this along). Stirring is what makes this dish so creamy– so be sure to stir every couple of minutes. When you have one or two ladles of stock left, slowly sprinkle on the grated cheese while stirring to incorporate into the rice and veggie mixture. If you dump all of the cheese in at once, it is likely to clump together rather than melting evenly throughout the risotto. 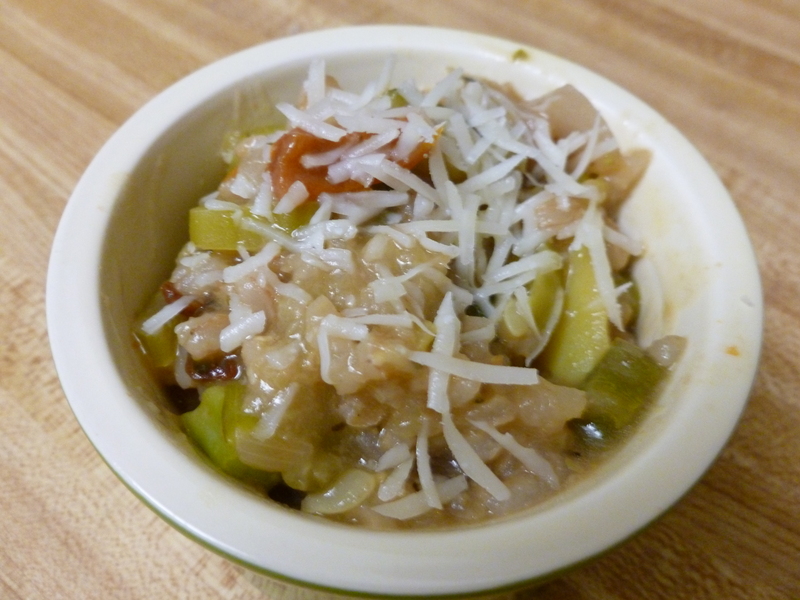 Once the cheese has melted into the risotto, it’s ready to eat! Serve with a fresh grating of cheese (mmmm cheese) if desired.